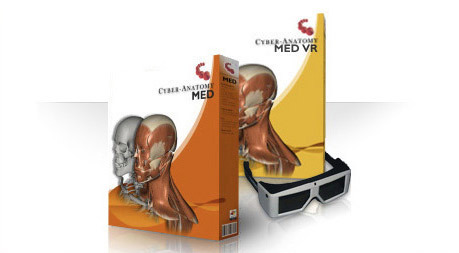 Cyber-Anatomy Med™ and Med VR™ are the de-facto standard for medical-level teaching of anatomy. 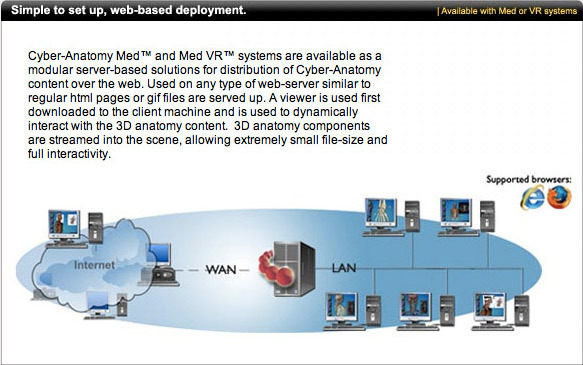 This software application and virtual reality solution are the most advanced comprehensive method for anatomy education. Anatomy is rendered as objects floating in 3D space, creating an immersive experience. Supports up to 250 concurrent users. 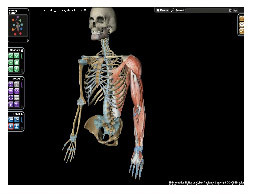 Not only does Cyber-Anatomy human anatomy software provide these remarkable features, it also allows the student or teacher complete interaction and control of what is being studied. Comprehension andretention are elevated when the student can visualize and manipulate the anatomical structures in this manner. Explore the bone structure of the feet, then superimpose the nervous system and muscular systems. Remove layers, muscle by muscle. 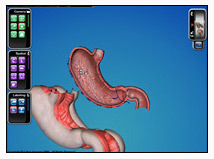 This can be achieved simply by using the PEEL and STICK button functions to remove the anatomy.